Is Brahmi the oldest script of India. The mysterious script of Indus Valley civilization, which is not deciphered yet may have some ancestral connection with Brahmi script can be deciphered in coming years. A palm leaf manuscript discovered from Harappan site in Afghanistan has strengthened the belief of existence of a proto Brahmi script, which was used by Indus Valley people. This discussion was raised by Dr DP Sharma, Harappan archaeologist and director, Bharat Kala Bhawan, Banaras Hindu University(BHU) in the International Conference on Harappan Archaeology held recently in Chandigarh. According to Sharma, who has carried out research works on the palm leaf manuscript with Archaeological Survey of India (ASI) for last five years, the palm leaf has Harappan as well as Kohi script engraved. "Kohi symbols and letters have an affinity with the Harappan script and hence can be very significant in the decipherment of Harappan scripts. At the same time the palm leave manuscript has seven lines, which is the longest script recovered from any Harappan site. So far the scripts or the signs of Indus Valley script engraved on tablets, seals, potteries and other objects had not more than 18 letters or pictures," informed Sharma. Sharma also said, "The script on the palm leaf runs from right to left while Brahmi script runs from right to left. 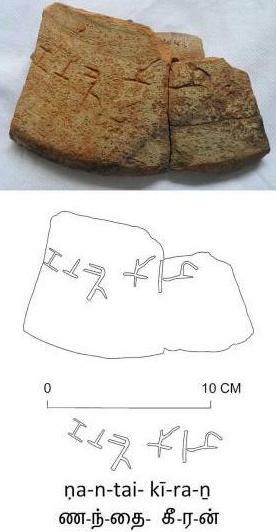 The objects discovered from excavation sites indicate that they were using two scripts as few objects have right to left run of the script while some objects have left to right written scripts. However, no traces of objects with bilingual scripts has been found so far ofHarappan period, which suggests that there was only one script called Brahmi and the script that Harappan people used was an older form of Brahmi called 'proto Brahmi'. During the mature Harappan period (2700 BC to 2000 BC) the direction of Harappan writing system was right to left and later on around 2000 to 1500 BC they started their writing system from left to right. The existence of no long manuscript had posed the difficulty in deciphering the Harappan script, however, the manuscript on palm leaves may solve this problem". Sharma further strengthens his argument by quoting the DNA analysis carried out by Dr Lalji Singh, vice-chancellor, BHU. According to Sharma, the analysis by Singh suggests that the two ancient races Aryan and Dravidians were native of India and none of them came outside of our country. The Aryan and Dravidian races in India have the same genetic basis. This suggests that proto Dravidian and proto Aryan races were present in Harappan population and Harappan were using proto Dravidian and Sanskrit as their language and their script was proto Brahmi only. According to Sharma, during the conference, his research works in deciphering the Harappan scripts were also consolidated by BR Mani additional director general, ASI. "These new researches can help a great deal in deciphering the Harappan script and once the script is deciphered a number of mysterious seals, square pieces, pottery, coins and other objects can be read and hence we can know about their trade, literature, art and other aspects of civilization," informed Sharma.